Thanks to the fast-paced digital arena and the vast number of tools and platforms available for marketing, it can be hard to know what areas will be most useful for your business and industry. 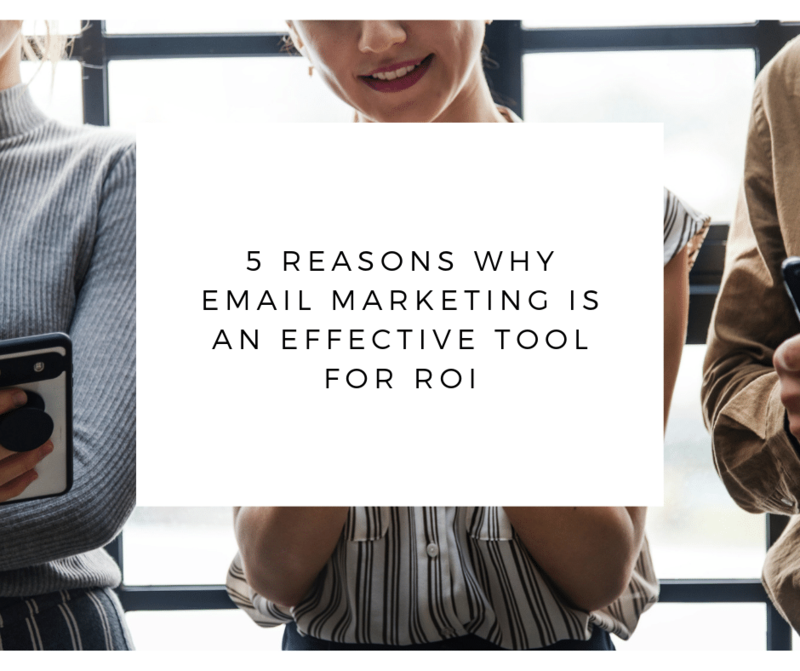 For a lot of companies, email marketing has been a consistent and effective way to connect to customers and delivers a fantastic ROI. While it might not be the first choice when faced with the ever-popular Facebook and Google advertising, email marketing offers a more traditional and personable approach to customer communication. Out of all the digital communication strategies on offer, email marketing continues to outperform its peers year on year, so let’s take a look at why it’s such an effective way to generate revenue for businesses today. Email is extremely cheap when you consider the alternatives. Press, TV and digital advertising can all put a decent dent in your marketing budget. Email marketing, on the other hand, costs a fraction of the price, with software such as MailChimp or SharpSpring costing as little as a few hundred dollars monthly for unlimited communication. With a high-quality database and a solid, consistent email strategy in place; you’ll have a great ROI, for not much expenditure. Building an email database can take time, but once you have a quality list to talk to, the results can be fantastic. Email marketing gives you the ability to have highly personalised conversations. By leveraging your customer data and segmenting by interests or purchasing behaviour, you are ensuring they are receiving the content they want to read. This personalised content improves the conversion tenfold verse talking to a targeted audience through a digital platform such as Facebook. SharpSpring, our preferred CRM platform, offers email marketing (along with much, much more) which enables high segmentation and personalisation to your email database. By utilising this software, you are able to not only deliver customers with specific sale information based on their purchase history, but also connect with them using personalised messages, images, and discounts. The platform collects information on your customers during every interaction, meaning you have more and more reasons to talk to them. Not only is email communication cheap and effective, it’s also measurable. You can see who clicked what button, at what time and whether or not they converted to a sale. This information is vital to improve your email campaign results over time. If you sell clothes, you might find people are online more at night, so they are more likely to see and open your email. If you sell boating equipment, you might send a voucher out on a Saturday morning which has people running to your store. Email marketing gives you the opportunity to test, test and test again until you have the perfect email strategy; and it won’t cost you the earth. Does connecting with your customers and driving sales without lifting a finger sound appealing? Of course, it does. A solid email marketing and automation strategy can be completely hands-free, leaving you with more time to run your business. You can read more about marketing automation, and how it can transform your business in our eBook, here. Still not convinced? Talk to our team, and we can show you exactly how effective email marketing can be. It enables you to connect with customers in a highly targeted way, it’s 100% measurable, and delivers a healthy return on investment. The success of email marketing comes from customer engagement, and when you’re able to effectively communicate with your customers in a manner that’s both easy and engaging, increased sales and ROI are sure to follow. Ready to embrace email marketing? Get in touch with us at Chilli. We are a marketing agency based on the Sunshine Coast who excel in reaching customers and getting results for our clients. We are much more than email, we are a full-service agency, offering marketing strategy, website design and development, digital advertising, branding, graphic design and videography services. So, no matter what your business needs to get seen and heard, we are your team. Let’s chat today.